This example shows how to perform mixed mu-synthesis with the dksyn command in the Robust Control Toolbox™. 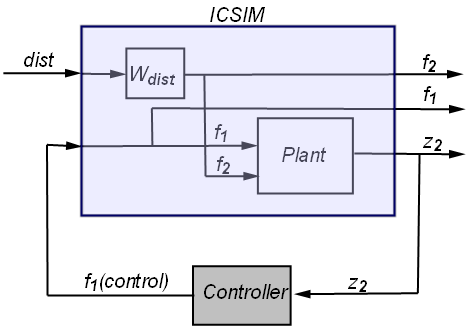 Here dksyn is used to design a robust controller for a two mass-spring-damper system with uncertainty in the spring stiffness connecting the two masses. This example is taken from the paper "Robust mixed-mu synthesis performance for mass-spring system with stiffness uncertainty," D. Barros, S. Fekri and M. Athans, 2005 Mediterranean Control Conference. Consider the mass-spring-damper system in Figure 1. Spring k2 and damper b2 are attached to the wall and mass m2. Mass m2 is also attached to mass m1 through spring k1 and damper b1. Mass 2 is affected by the disturbance force f2. The system is controlled via force f1 acting on mass m1. The controller measures the noisy displacement of mass m2 and applies the control force f1. The sensor noise, Wn, is modeled as a constant 0.001. The actuator command is penalized by a factor 0.1 at low frequency and a factor 10 at high frequency with a crossover frequency of 100 rad/s (filter Wu). The unit magnitude, first-order coloring filter, Wdist, on the disturbance has a pole at 0.25 rad/s. The performance objective is to attenuate the disturbance on mass m2 by a factor of 80 below 0.1 rad/s. The nominal values of the system parameters are m1=1, m2=2, k2=1, b1=0.05, b2=0.05, and k1=2. The value of spring stiffness k1 is uncertain. It has a nominal value of 2 and its value can vary between 1.2 and 2.8. Construct an uncertain state-space model of the plant with the control force f1 and disturbance f2 as inputs. Add the unmodeled delay dynamics at the first plant input. Plot the Bode response from f1 to z2 for 20 sample values of the uncertainty. The uncertainty on the value of k1 causes fluctuations in the natural frequencies of the plant modes. Use connect to construct the corresponding open-loop interconnection IC. Note that IC is an uncertain model with uncertain variables k1 and Delta. Uncertain continuous-time state-space model with 3 outputs, 3 inputs, 8 states. Type "IC.NominalValue" to see the nominal value, "get(IC)" to see all properties, and "IC.Uncertainty" to interact with the uncertain elements. You can use the command dksyn to synthesize a robust controller for the open-loop interconnection IC. 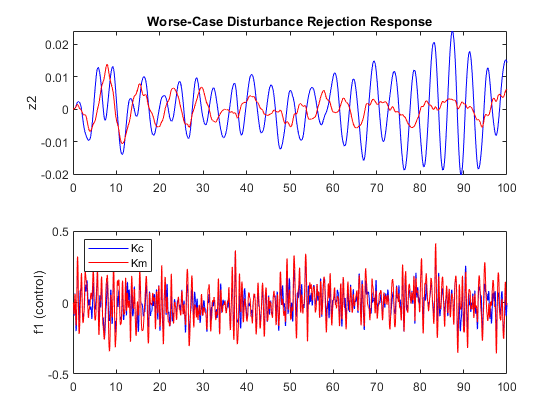 By default, dksyn treats all uncertain real parameters, in this example k1, as complex uncertainty. Recall that k1 is a real parameter with a nominal value of 2 and a range between 1.2 and 2.8. In complex mu-synthesis, it is replaced by a complex uncertain parameter varying in a disk centered at 2 and with radius 0.8. 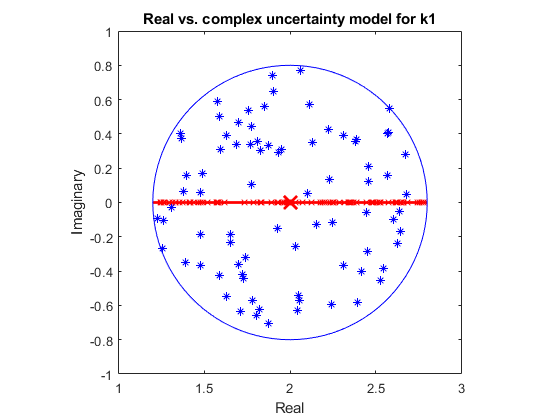 The plot below compares the range of k1 values when k1 is treated as real (red x) vs. complex (blue *). Synthesize a robust controller Kc using complex mu-synthesis (treating k1 as a complex parameter). Note that mu_c exceeds 1 so the controller Kc fails to robustly achieve the desired performance level. Mixed mu-synthesis accounts for uncertain real parameters directly in the synthesis process. Mixed-mu synthesis is enabled via the dkitopt option MixedMU. The dkitopt option AutoScalingOrder is used to set the order of the D and G scalings used in mixed-mu synthesis. The D scale orders, associated with the complex uncertainties, are set to a maximum of fifth order and the G scale order, associated with the uncertain real parameters, are set to a maximum of sixth order. Mixed mu-synthesis is able to find a controller that achieves the desired performance and robustness objectives. 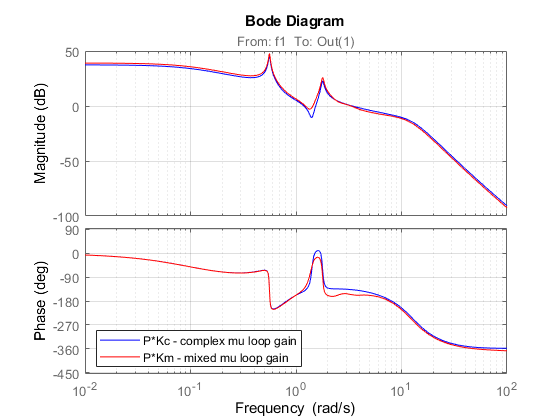 A comparison of the open-loop responses shows that the mixed-mu controller Km gives less phase margin near 3 rad/s because it only needs to guard against real variations of k1. A comparison of the two controllers indicates that taking advantage of the "realness" of k1 results in a better performing, more robust controller. 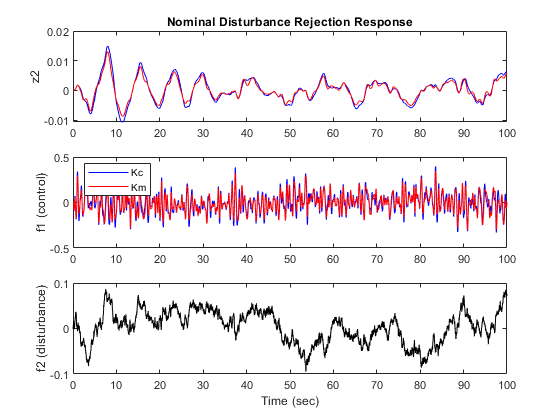 To assess the worst-case closed-loop performance of Kc and Km, form the closed-loop interconnection of Figure 2 and use the command wcgain to determine how large the disturbance-to-error norm can get for the specified plant uncertainty. The mixed-mu controller Km robustly achieves the desired performance since the worst-case gain of the closed-loop system clpKm is less than 1. 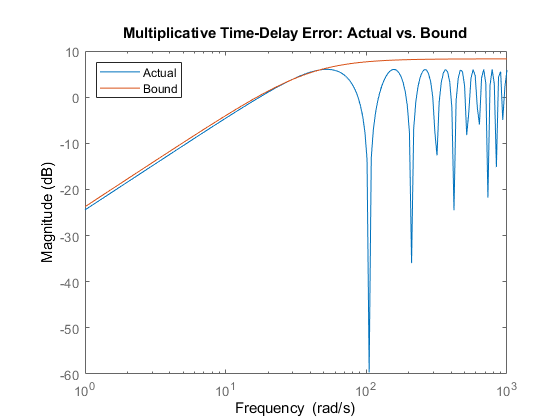 The complex-mu controller Kc, however, fails to robustly meet the specifications since the closed-loop gain reaches 4.2 for the worst-case value badpertKc of the plant uncertainty. 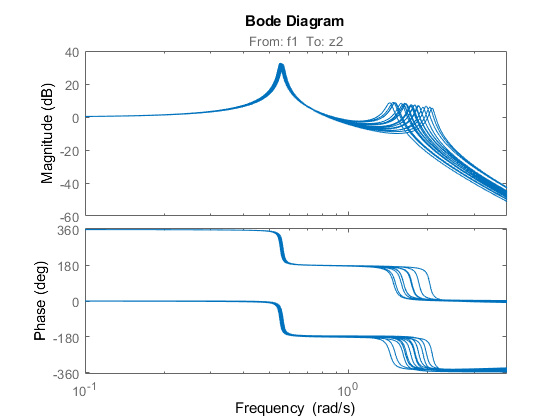 Inject white noise into the low-pass filter Wdist to simulate the input disturbance f2. The nominal closed-loop performance of the two designs is nearly identical. Next, compare the worst-case scenarios for Kc and Km by setting the plant uncertainty to the worst-case values computed with wcgain. This shows that the mixed-mu controller Km significantly outperforms Kc in the worst-case scenario. By exploiting the fact that k1 is real, the mixed-mu controller is able to deliver better performance at equal robustness.